Last weekend I visited the British Museum and took the photo below of the Neo-Assyrian Planisphere (K8538). 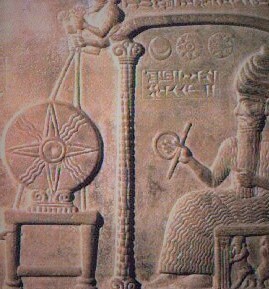 The planisphere dates from about 650 BCE in the time of King Ashurbanipal. There are many interpretations of the planisphere both in published literature and on the internet, however, its a map of the night sky and some constellations can be seen on the surface (Gemini at 8 O' Clock and Part of Virgo at 5 O' Clock and the Pleiades at 9 O' Clock, also there is an arrow at 2 O' Clock with a star that could be Sirius). What is clear is that the planisphere is divided into 8 segments and shows the January night sky over Nineveh. But why would the astronomers of Nineveh want to divide the sky into eight and not twelve to show the zodiac? In ancient times our ancestors must have looked up into the night sky and seen chaos. However, logic and reason prevailed and they attempted to make order and sense of the night sky. 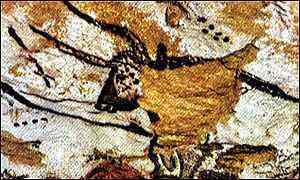 The cave paintings in Lascaux date from the ice age over 16,500 years ago and show a bull with six dots above, could these be the Pleaides above Taurus the Bull? Six stars is the average most people can see although on a clear night with good eyesight seven stars are visible. Galileo in Sidereus Nuncius refers to the Pleiades as the six stars of the bull as the seventh star is rarely seen. So why would the Assyrians want to divide their map of the night sky into 8 equal parts? I think the answer that they saw eight celestial spheres in addition to the fixed stars. These are the Sun (Shamash), The Moon (Shin), Mercury (Nabu), Mars (Nergal), Jupiter (Marduk), Saturn (Ninurta) and Venus which they counted twice as the morning star (Ninanna or Inana) and the evening star (Ishtar). They may well have known that the morning star and the evening star were the same but this solved the dual nature of Venus as both the goddess of love and the god of war. Venus was male in the mornings but female in the evenings. Venus is depicted as an eight pointed star in other Assyrian artwork such as the Sun Tablet or Shamash Kudurru in the British Museum. Venus has an eight year cycle that was described on another Assyrian stone tablet. The Shamash Kudurru is a boundary stone about 3 feet high which shows the Moon as a crescent, the Sun as a four panelled star (on a table) and Venus as an eight pointed star. I think the arrow on the planisphere indicates that the disk was to be aligned in some way at the night sky so that it was a guide either for navigation, astronomy or priestly rituals. Other cultures also divided the night sky into eight such as the ancient Mayans, the ancient Egyptians and in Neolithic China (the Bagua). The compass is also divided into eight directions (a scheme used first in the Han Dynasty 206 BCE) although it was not used in Europe until the twelfth century. In Ely the cathedral has a magnificent octagonal tower. The current tower dates from 1400 CE but there is evidence of an earlier tower in 1083 CE. By projecting geometric shapes and patterns into the night sky our ancestors were able to establish order and harmony in the universe and then able to use the passage of the Moon, stars and planets in the sky to chart the passage of time on Earth. Harmony in the Heavens brought harmony on Earth, or according to Hermetic wisdom "as above so below".